We know that everyone likes to give a small nicely packaged gift to those around them. That's why we've found wonderful eco friendly packaging to hold just a couple of items from our shop. You tell us what to include and we'll complete the gift with a nice bow and card. 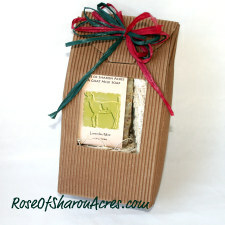 Your recipient will enjoy their all natural gift with a handmade touch and thank you for it. Great for teachers, office parties, birthdays or any occasion that requires a small gift. Best of all it's made in the USA! A FULL Pound of Goat Milk Soap!